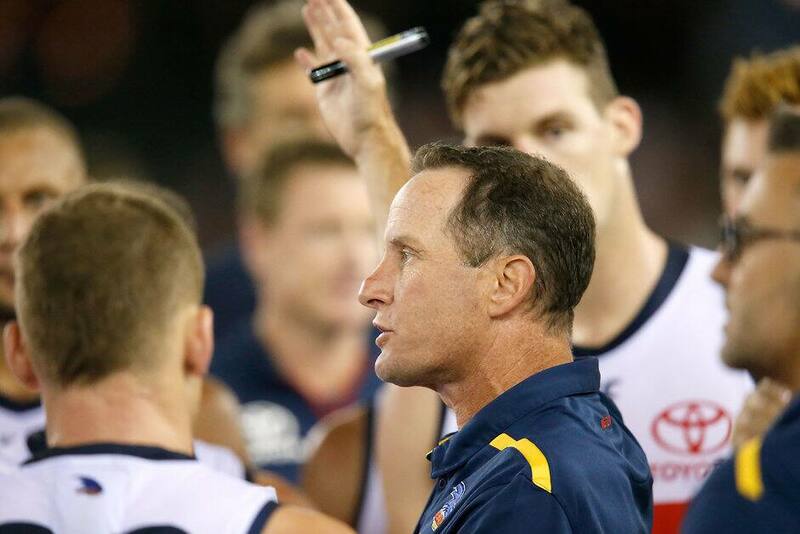 Adelaide coach Don Pyke expects there are some late nights to come in the week ahead as he tries to figure out why his team continues to fall short of expectations. Pyke held an extended post-match conversation with his players after Saturday night's 12-point loss to previously winless North Melbourne consigned the Crows to a third defeat in four rounds. They managed a meagre 36 inside 50s for the night and lost the disposal, clearance and contested possession battle in significant fashion. "Clearly, we're not playing to, I believe, our capacity and we're not playing consistently good footy, so we just had a chat about what they're feeling and put a few ideas on the board," Pyke said. "At the moment, we're losing contest and that's been the last couple of weeks, which gives away some field position. "When we're trying to move the ball, we're clearly not efficient with the ball and we're making skill errors, so we just had a conversation around what that actually looks like and what's causing that. "We've got some things to fix, there's no question." The result came after Pyke made the bold call to omit Bryce Gibbs to the SANFL. Cameron Ellis-Yolmen was preferred and did an admirable job at times on Ben Cunnington while gathering 16 touches of his own. Gibbs played well at state league level, but Pyke stopped short of guaranteeing him an AFL call-up. "The reality is we didn't have a great deal of winners on the night and we're not going to make massive, wholesale changes on the basis of that. "We need to look at the reason why we've got guys who we know are capable of performing better than they are, but aren't. "That starts with me and conversations with them, but we need to get them into a headspace where they're capable of playing the footy they can play." Pyke refused to blame the absence of Chayce Jones (concussion) after quarter-time or free kicks that went the Kangaroos' way. Having said that, he plans to speak to the AFL about some of the umpires' decisions, almost certainly including one that went to Ben Brown in the third quarter against Reilly O'Brien. "There were a couple of interesting ones in the ruck tonight," Pyke said. "There were a couple of CB (centre-bounce) ones as well, which we might get some clarity from them on, but that's the ebb and the flow of the game. "It's not the difference in the teams tonight."